These are exciting times friends. 'We Have a Problem! ', our popular maths resource to support the teaching of word problems, has been published by Badger Learning. What was once a small PDF has been extensively rewritten and redesigned to form four 64-page books (covering Year 3 to Year 6) containing lesson plans, activities and copymasters. 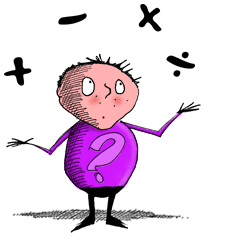 Doodles, Mexican waves, blobs and Kung fu (amongst other things) all feature to help inspire your pupils about a subject that can often be less than inspirational - word problems. Real-life word problems are a good example of an area where the 'skills behind the problem' sometimes get left behind in a rush to find the answer to the question. Through unique activities, 'We Have a Problem!' encourages your pupils to dissect word problems and see what they're really asking. To find out more, pop us an e-mail or visit the Badger Learning website where you can also order a copy for your school. So, if you're a creatively-minded teacher who wants to get their hands on some truly sparky resources, tell your maths co-ordinator about 'We Have a Problem'... Word problems will never be the same again.